British rock legend David Bowie has been an innovator in music and fashion since the 1970s. Famously known for his androgynous alter-ego Ziggy Stardust, Bowie created a cult following that influenced the glam rock era. He constantly changed his persona and musical style to adapt to the times, and in doing so, created a musical empire that still influences the music and fashion worlds today. 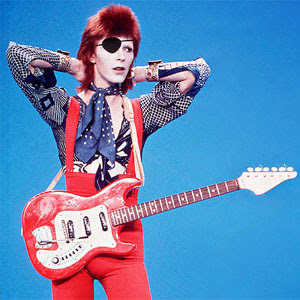 If you want to be inspired by some of David Bowie’s most famous styles, look no further than the outfits below! The look below is inspired by the classic, business side of David Bowie, which is consistent with his current style today. Start with menswear-inspired pieces like collared shirts and vests, and swap out typical preppy accessories for edgier ones like leather pants and studded earrings. I also love the shoes – as soon as I saw them, they just screamed David Bowie! Product Information: Jacket- ModCloth, Pants- Forever 21, Vest- ModCloth, Blouse- Asos, Earrings- Asos, Scarf- Forever 21, Heels- ModCloth. This outfit captures Bowie’s Ziggy Stardust-era fashion, and the looks that made him so iconic. Back in those days, he loved to mix patterns and never underestimated the impact of striped clothing. He also wore lots of structured, broad-shouldered jackets in bright colors that set him apart from other musicians of the time. Recreate his Ziggy-era looks by pairing a printed jacket with these unique leggings and Doc Martens. Add a shiny top, striped headband, and glam rock ring for the perfect stage outfit. Product Information: Blazer- Asos, Ring- Forever 21, Leggings- Urban Outfitters, Tank- Urban Outfitters, Headband- Forever 21, Boots- Endless. 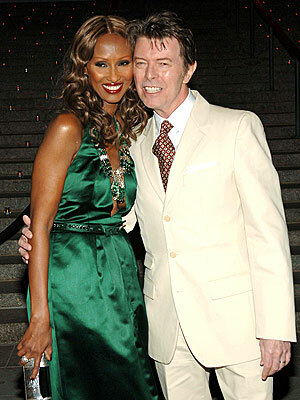 One of the most inspiring aspects of David Bowie’s style is his use of bold, daring makeup. He often used glittery and metallic face paint to create circles and lightning bolts across his entire face, looks that were very innovative at the time. Try your hand at Bowie-esque makeup by procuring some different sized makeup brushes and face paints or liquid eyeliners. Try adding glitter, gemstones, colored hair extensions, whatever your heart desires – the goal is to be creative and make a statement! 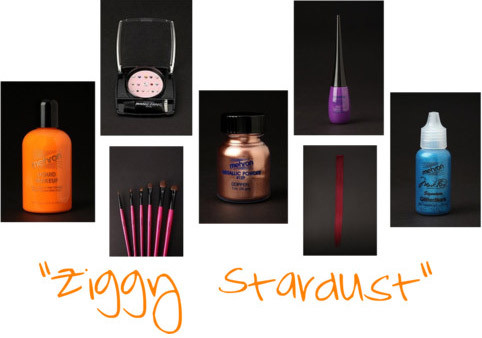 Product Information: All makeup, brushes, and hair extensions – Urban Outfitters. “Space Oddity” – This song launched Bowie to fame in 1969 when space travel was just becoming a reality. It tells the story of astronaut Major Tom and was actually used on televised coverage of the Apollo 11 lunar landings. “Let’s Dance” – His only single to reach number one both in the U.K. and the U.S., this song introduced David Bowie to a younger audience in the early 1980s. “Modern Love” – David Bowie has said this song is inspired by Little Richard, and its upbeat melody makes it perfect for listening to on a sunny day. “Changes” – A classic, enduring song, “Changes” describes the way Bowie felt about his constantly re-invented image and musical style. These are just a few of David Bowie’s many hits from his incredible musical career. For more information on what David Bowie is up to today, visit his website. Still want more Bowie fashion? 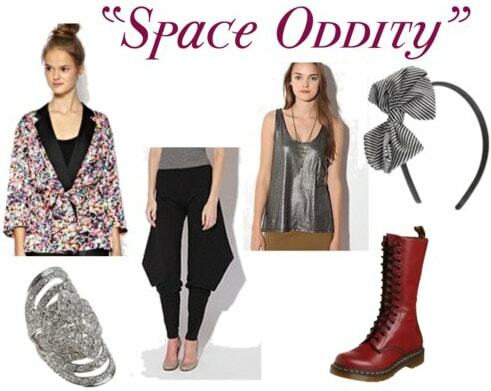 Check out these other great items inspired by David Bowie’s eclectic style! Product Information: Pants- Forever 21, Blazer- Asos, Skirt- Forever 21, Bowie T-Shirt- Old Glory, White T-Shirt- ModCloth, Bowie Face T-Shirt- Amazon, Dress- ModCloth, Blazer- Asos, Makeup- Urban Outfitters, Gray Shirt- ModCloth. Do you love David Bowie’s style or music? How do you use makeup creatively to express your style? Have any suggestions for artists to feature in other posts? Let me know in the comments!